When I asked the concierge for directions to cafes and shops, he told me to walk three blocks to the traffic lights, then turn right to California or left to Nevada. “You’ll see the difference,” he said. 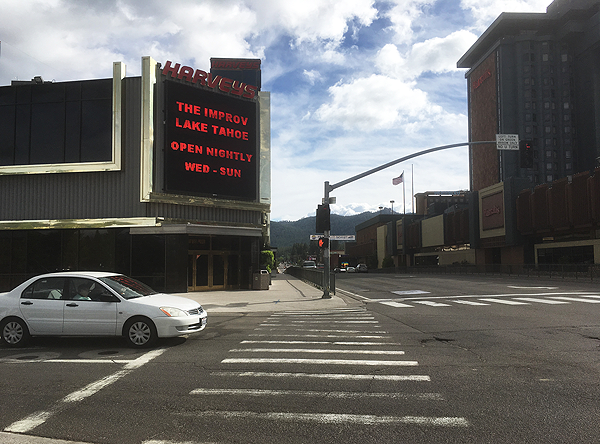 Little did I know when I booked a vacation to Lake Tahoe that I would straddle two states on opposite sides of the street with such different walking and safety experiences. The photo below shows California’s alpine architecture on the right and Nevada’s polished glass on the left. Not only did I find the left-hand side of the street scary, I couldn’t find a door with all those mirrors. Believe it or not, the California side led to a place called “Heavenly Village.” Did Nevada lead to “Sin City?” Maybe. 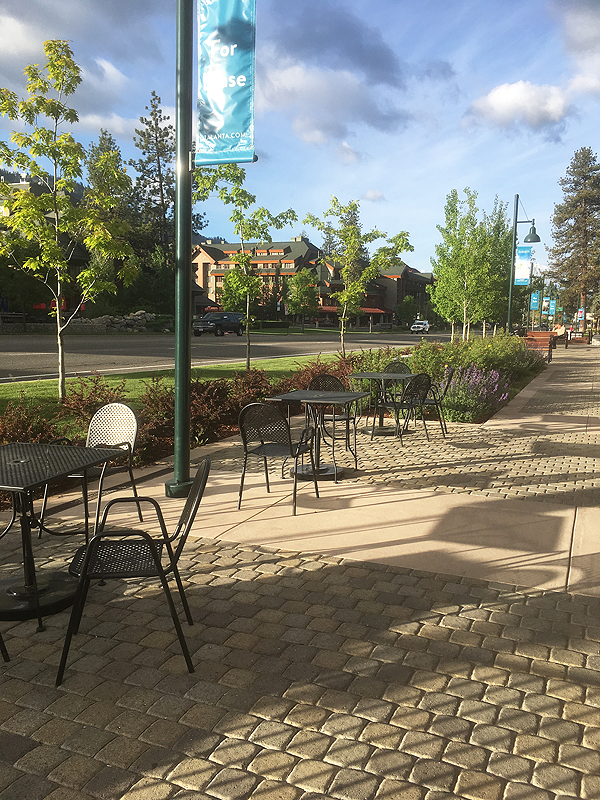 The next picture shows the corner where I turned right to see California’s wide, walkable sidewalks with patterned pavers leading to open spaces, outdoor cafes and flowery landscaping. The sign said “welcome,” the bright colors beckoned, and I felt safe. Then I turned 180 degrees to take the photo below of the Nevada side. Notice the skinny cement sidewalks, lack of pleasing outdoor space and absence of greenery. The casino’s neon sign against the black and brass building felt like Darth Vader beckoned; I turned away. The differences were palpable. The decision—easy. Avoid the stressful street in Nevada and embrace the welcoming one in California. That’s where I turned. And, of course, we face that same decision building everywhere in America today; do we want to make more ‘approachable’ places or ‘avoidant’ ones? 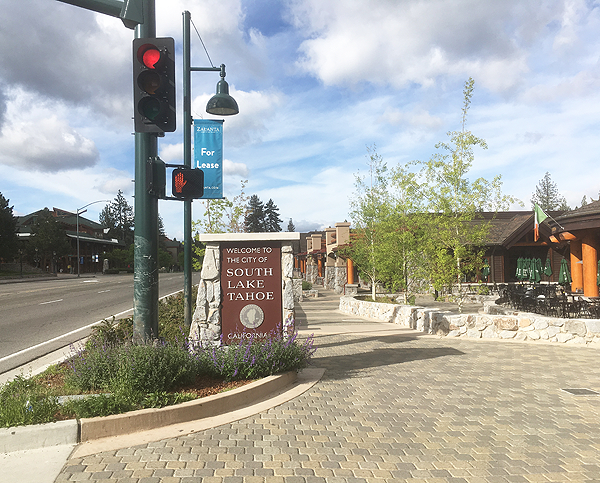 South Lake Tahoe makes the answer clear; build places people want to be—inside + out. It will be better for us all, and our descendants will thank us. 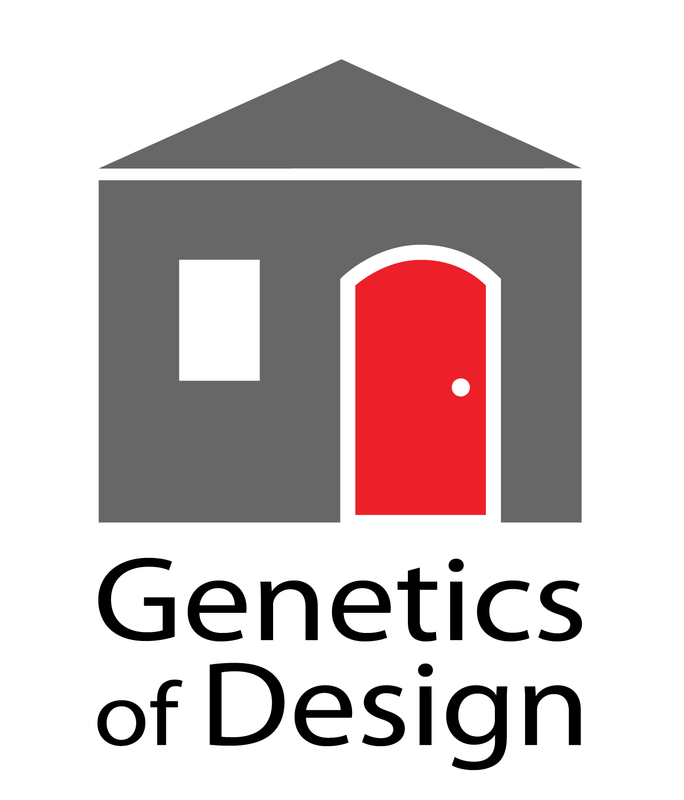 This entry was posted in Architecture, City Planning, Health, People-centric Design, Walkability and tagged safety, Walkability. Bookmark the permalink.